Soul Food for Young Adult Communities: Sunday July 14th 2013: Fifteenth Sunday of Ordinary Time. Letter to Sinead, Mark, and Friends, – young adults who are searching. The Gospel of this Sunday is about the Good Samaritan, in Luke 10:25-37. Read it for yourself, or find it in Mass Readings for Sunday, by clicking here. This week’s letter is written by Sarah Kelly, a young adult. Thanks Sarah! Croagh Patrick Mountain, Mayo, Ireland. What does today’s Gospel say to you? Well, I can tell you now exactly what it says to me. 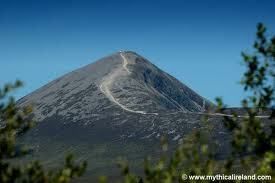 Two weeks ago, I climbed Croagh Patrick with a few friends. I always find the experience challenging, exhilarating, and rewarding. I have climbed the Reek on numerous occasions, but this time, something felt strange. Before my ascent however, I asked our Lady to protect the group I was climbing with and all those who would be climbing that day. I prayed that she would keep us all safe and bring us safely back. So, Rosary in hand we briskly began our ascent. It was a lovely morning, although cloudy with a fearful wind. 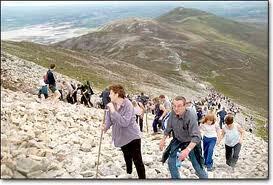 Pilgrims near the top of Croagh Patrick. transport me off the mountain and bring me home. I begged that He would send me some of His angels to help me. Not too long after, something quite wonderful happened. A paramedic, who ‘just happened’ to be climbing that day appeared, and with the help of his brother and my friends, were soon helping me walk down the mountain. It actually felt like I was flying we moved that fast. I was so deeply moved by this, but yet, I had no way of thanking these ‘good samaritans’. The Lord sent me these helpers when He saw I was in need. My legs took a while to recover, but I left that place altered forever. God chose that experience to teach me something. In today’s Gospel, I share the experience of the “man going down from Jerusalem to Jericho”. I may not have fallen into the hands of wicked robbers, but I did fall victim to my own human limitations. So many passed by me, as they did the man in the Gospel. Which made me think, how often do we pass by people? How many are invisible to us today? But the Samaritan looked with compassion on this man, beaten and bruised by circumstance. He lifted him up and looked after him, and when he was unable to tend him, he paid others to look after him: “Take care of him and whatever you spend on him, I will repay when I come back”. Though there was nothing I could do to show my gratitude to these absolute strangers, I know in my heart that they will be rewarded. So, I leave you on this note… who is your neighbour? Who is my neighbour? Ponder this in your heart today, and let the Gospel of Jesus sink deep into your heart, and “go then and do the same”. ← FAMILY FUN DAY, this Coming Weekend, July 13th, 14th, 2013!